Sub-X uses two identical solid 1.25% Silver-Plated Long-Grain Copper conductors for positive and negative. Solid conductors eliminate strand-interaction distortion. Foamed-PE insulation minimizes signal smearing. A 100% coverage shield ensures noise-free performance. Gold-plated high-conductivity brass plugs are attached with specially-formulated AQ Silver Solder. Solid 1.25% Silver-Plated Long-Grain Copper Conductors: Silver-Plated Copper always provides superior performance for video and digital audio. Unfortunately when used for full-range analog audio, the discontinuity of silver plating over copper causes high frequencies to sound edgy and harsh. However, when used only for subwoofer frequencies, Silver-Plated Copper's "artificial edge" actually enhances the articulation and intelligibility of low-frequency information. 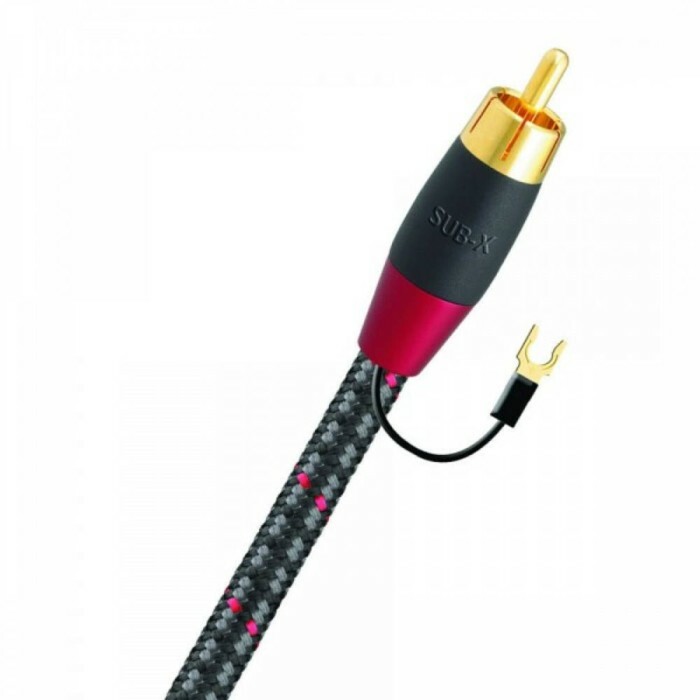 Do not use AudioQuest's Silver-Plated Copper subwoofer cables for full-range audio. Foamed-Polyethylene Insulation: Any solid material adjacent to a conductor is actually part of an imperfect circuit. Wire insulation and circuit board materials all absorb energy (loss). Some of this energy is stored and then released as distortion. Sub-X uses air-filled Foamed-Polyethylene Insulation on both conductors because air absorbs next to no energy and Polyethylene is low-loss and has a benign distortion profile. Thanks to all the air in Foamed-PE, it causes much less of the out-of-focus effect common to other materials. Symmetrical Conductors: Sub-X has identical conductors for the positive and ground connections. Underneath the 100% coverage foil shield is a bare conductor, exactly the same as the insulated center conductor. The conductor under the shield does double duty as a low distortion audio connection, and as the drain wire connecting the shield to ground. Terminations: Precision gold-plated plugs are carefully attached with the very best solder. Through choice of flux and metallurgy, AQ solder has been optimized to make a low-distortion connection. All solder, including "silver solder," is a lousy conductor. The difference you hear between solders is a result of connection quality. AQ solder does not have a high silver content because the more silver there is in solder, the more difficult it is to make a good connection. Grounding:Sometimes there is a hum problem unless the subwoofer and AV receiver (or surround-sound processor) are attached to each other using a separate wire. If your system has a hum problem, try attaching the little spade-lug tails to the metal chassis of the subwoofer amplifier and to the chassis of the sending component. Usually, this extra wire will not be needed.